I call this an “aborted” review because I didn’t finish the book. That shouldn’t be taken as a criticism of the quality of the writing. I set the book aside unfinished because of my principles (or, if you prefer, my prejudices). I’ve already reviewed The Grace of Kings, the first book in Ken Liu’s Dandelion Dynasty series of fantasy novels. Think Game of Thrones but in a sort of Chinese setting, and somewhat less nihilistic. I enjoyed that book immensely, and gave it a glowing review. 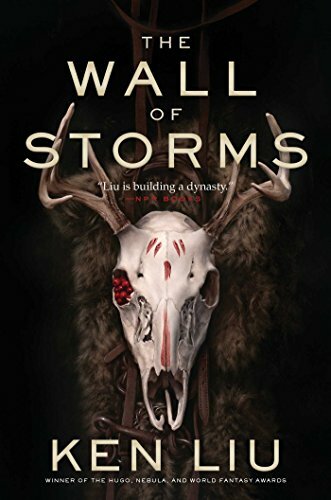 Wall of Storms is also a brilliant piece of world-building and storytelling. The world of the book is wonderfully imagined, intriguingly detailed, and multifaceted. Author Liu is a fine prose stylist. His writing is evocative, his characters complex and layered, and his dialogue sparkling and nuanced. What I didn’t like was the political correctness. Early on we are confronted with not one, but two homosexual relationships, treated as normal in the culture. Later on, an important (and highly sympathetic) character argues for sexual egalitarianism. I suppose I lack imagination, but I think fantasy ought to hew close to actual human nature, however much it may play with the cultural furniture. No human society has ever normalized homosexual marriage before ours did it (artificially, through legal maneuvering), and no human society has ever treated men and women interchangeably. This element of the story was plainly adopted by the author to ingratiate himself to right-thinking readers. So I don’t imagine he’ll miss my readership. I’ll be seeing more and more of this sort of thing as time goes on, I’m sure. But (at least for now) nobody can force me to finish a book that’s obviously trying to correct my thinking. Otherwise, it’s a really good book. You may love it. 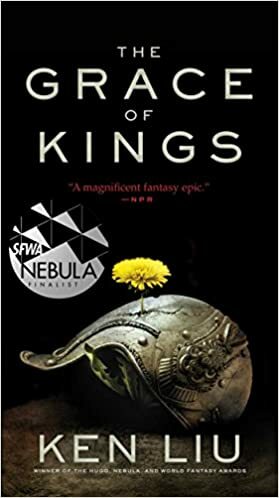 Kirkus Reviews did an interview with author Ken Liu earlier this year, in which he shares good thoughts about writing and his novel The Grace of Kings. The Grace of Kings is your first novel. What are the main differences between writing short fiction vs. long fiction, either in how you envision the story or its construction? I think on the practical side, there’s a lot more bookkeeping that must be done with novels: dates, plot points, character traits, worldbuilding details, etc. And decisions you make early on can have consequences hundreds of pages and months or years later. Since I’m not a natural planner when it comes to writing, I’ve had to learn to use various technologies like wikis and timelines to keep all this stuff straight. I suppose in a sense, writing a novel is a lot more like architecture while short fiction feels more like sculpting. Divination was an ancient art in the Islands of Dara, but no Tiro state was more dedicated to its practice than scholarly Haan. After all, Haan was the favored land of the god Lutho, divine trickster, mathematician, and seer. The gods always spoke ambivalently, and sometimes they even changed their minds in the middle of your asking them a question. Divination was a matter of ascertaining the future through inherently unreliable methods. It isn’t often that a book leaves me in awe. But Ken Liu’s The Grace of Kings has me thunderstruck. Imagine a book written on the general Game of Thrones model. But imagine it set in a Chinese-based world. And imagine that in this story, courage is not always futile, and virtue is not always defiled. That’s The Grace of Kings. An epic in every sense of the word. In the world of Dura, the emperor of the Reign of One Bright Heaven is a cruel megalomaniac. Thousands die doing slave labor for his hubristic personal monuments. Almost by accident, a revolt breaks out and spreads. Soon to be caught up in it are Kuni Garu, a commoner, a former gambler and bandit, and Mata Zyndu, descendent of heroes, tall and strong and himself a figure out of legend. The two men’s gifts are different. Kuni Garu is intelligent and humane, always chiefly concerned with the welfare of others. Mata Zyndu is obsessed with courage, heroism, and ideals. Their complementary virtues make them leaders and brothers. They win the war. This is a book that will reward re-reading. I’m not at all sure I agree with its message (assuming there is one, or only one), but the story is eminently worth wrestling with. Much blood is spilled, but it’s not heartless. It’s rich in complex characters and moral ambivalence, but it’s not amoral. I’m overwhelmed by The Grace of Kings. I highly recommend it. Not for young children.